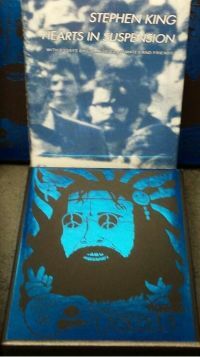 HEARTS IN SUSPENSION - First Printing Hard Cover. Featuring foil embossed artwork by Glenn Chadbourne. Featuring Stephen King, with an original, and very long, essay! HEARTS IN SUSPENSION is a brand new collection of original essays concerning the 60’s and 70’s, and the times that were changing in those years. The rural learning how to deal with the cultural change in Maine, the US, and the world. 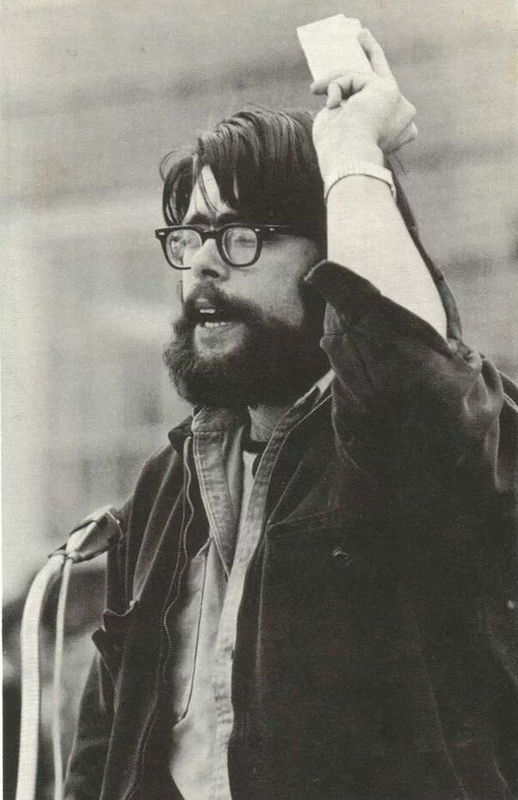 Stephen King was a force during his years in college, in Maine. 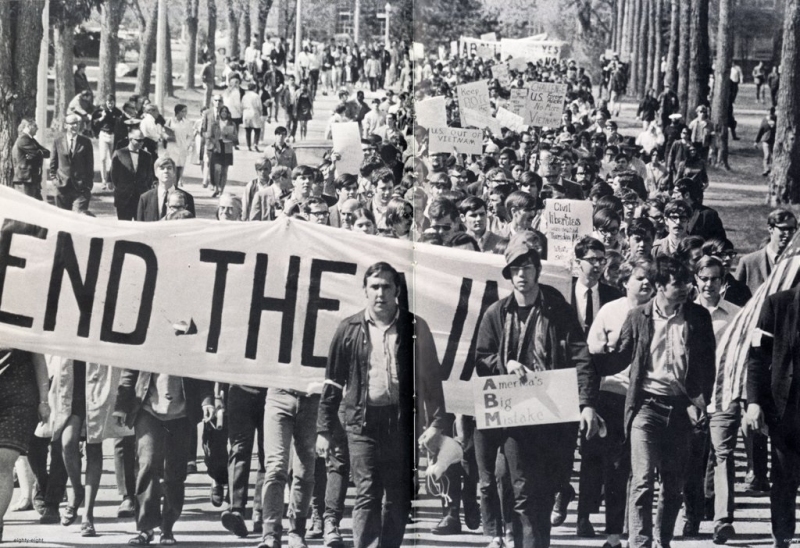 The publisher informed us that “this is a book about the experiences of the 60’s and the 70’s with students that attended the University of Maine during those times. These are also fellow students that attended school with Stephen king. The editor, Jim Bishop, was one of Stephen King’s professors (along with Bert Hatlan), and Mr. King was in Jim Bishop’s writing workshop. Mr. Bishop was an early supporter of Stephen King’s work, and it’s a testament to Mr. Bishop, and to Stephen King, that after all these years they get the opportunity to work together on this original collection of work. A sort of completion as to where this all started. I think that’s just fantastic. The publisher, who has read Stephen King’s piece, informed me that Stephen King’s essay is quite long (in fact the longest of the set of about ten essays by various authors), and he says that the essay is “funny, truthful, and an involved work about Steve’s experiences during the 60’s, 70’s and the anti-war work of the Vietnam era, and so much more.” He said that King also discusses his “Garbage Truck” series that was published in the college newspaper. Since many readers look for these rare works, this will be an interesting insight into his series of columns. FEATURES FOR THIS EDITION – WITH an EXCLUSIVE SLIPCASE for STEPHEN KING CATALOG! Illustrated with photos throughout the book. Sewn and bound hard cover. 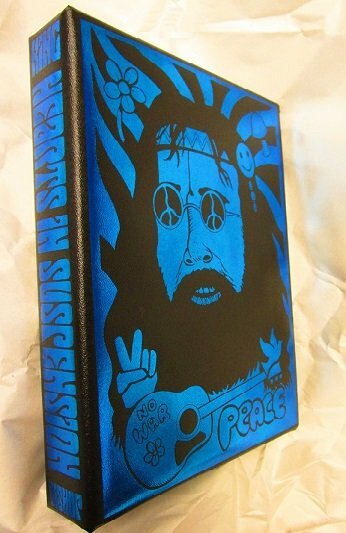 EXCLUSIVE SLIPCASE! Featuring foil embossed artwork by Glenn Chadbourne. A percentage of proceeds from our sales will go to Stephen King’s HAVEN FOUNDATION, which supports authors and artists in need.